Saint-Félicien, Que. – August 7, 2018 – Food retail members at IGA Marché Lamontagne et filles in Saint-Félicien, Quebec renewed their union contract on June 27, 2018. 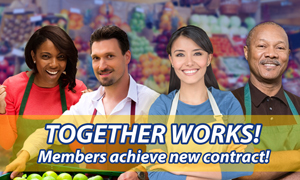 The new contract was approved by 88 percent of the 100-plus UFCW Canada Local 500 members in the bargaining unit. As part of the new union contract, a four percent wage adjustment will be made in the first two years for butchers, and employees at the end rate of the wage scale will receive a two percent annual wage increase. The creation of three regular employee positions. ‘‘We are very happy to have approved this new union contract with IGA Marché Lamontagne et filles. We are proud of how much members trust the UFCW to represent them in their workplace. I would like to congratulate the bargaining team on its excellent work,’’ says UFCW Local 500 President Antonio Filato.